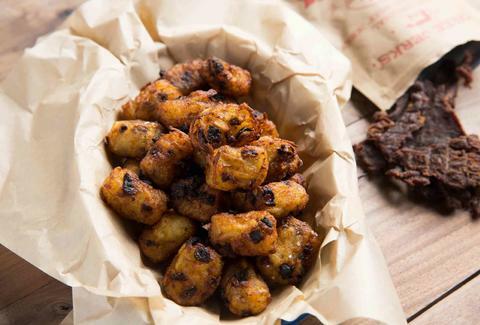 A hamburger and fries were my favorite meal... until I had jerky tots. Before rolling out tots to drop in the deep fryer, I mixed chopped beef jerky in with the shredded potatoes. My new favorite dinner brings that same protein and starch, but fried and in bite-size pieces. Plus, when I use Three Jerks hamburger-flavored jerky, the effect is even more real. Nirvana exists, guys, and it tastes even better dipped in yellow mustard. Place potatoes in a large saucepan and cover with cold water by 1 inch. Bring to a boil then simmer for 6 minutes. Drain and let cool. Shred potatoes on the large holes of a box grater. Use a dish towel or paper towels to drain as much water from the potatoes as possible. Transfer shredded potatoes to a large bowl. Stir in jerky, cornstarch, and salt. Measure 1 tablespoon of the potato mixture and roll into a short cylinder about 1 ½ inches long and ¾ inch wide. 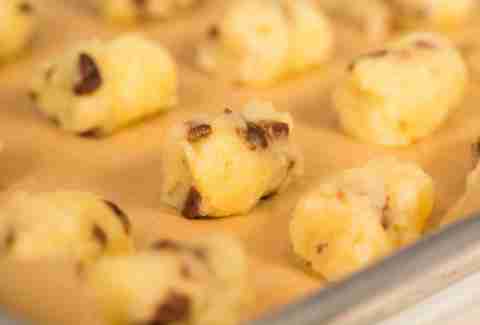 Place on a greased baking sheet and repeat with the remaining potato mixture. Heat oil to 350°F in a deep fryer or heavy pot fitted with a thermometer. 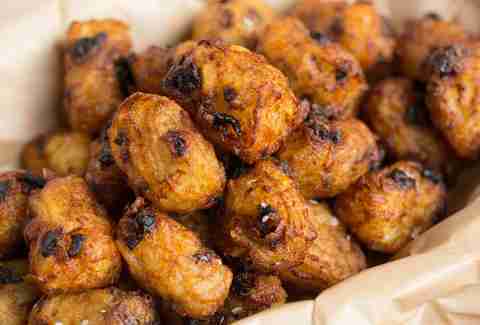 Fry tots, stirring occasionally, until golden brown and crisp, about 5 minutes. Transfer to a paper towel-lined plate to drain. Season immediately with salt. Serve hot with mustard.